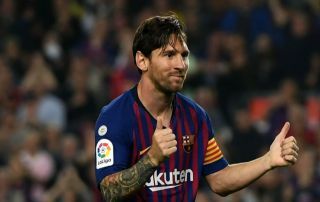 Barcelona don’t have a great deal of quality depth up front, and reports claim that Lionel Messi is eager for the club to address that by signing Krzysztof Piatek. The Catalan giants have been fortunate that Luis Suarez has been able to play as many games as he has, with a clear lack of an out-and-out striker available to coach Ernesto Valverde aside from him. While it hasn’t cost them to this point and the Spanish tactician does have options in terms of using the likes of Messi in a different role, it will surely be a concern moving forward, particularly with Suarez turning 32 in January. As noted by Sportmediaset, via Don Balon, it’s suggested that Messi sees Piatek as a potential solution to the problem, and wants the Polish ace to join Barcelona in January if a deal can be struck. The 23-year-old has also been the subject of interest from Napoli and Juventus, with Football Italia reporting that he may well be valued at around €50m and so it won’t be cheap to prise him away from Genoa. That isn’t the only concern though, as although he’s scored 13 goals in 13 games so far this season, that masks the fact that he hasn’t scored in his last five Serie A outings. In turn, whether or not that’s an indication that perhaps he merely enjoyed a good run of form to start the campaign and isn’t capable of scoring consistently is debatable, but until he gets back amongst the goals, it may well remain a question mark over him. For that sort of money, Barcelona will surely want to be signing a striker capable of scoring consistently, and Piatek has yet to prove he can do that at the highest level given that this is his first season in Italy. The talent and potential is certainly there, but the experience and pedigree is arguably still missing.